If you’ve ever come across any manga or anime, you’ve probably already heard people referred to as -san, -chan, -sensei or maybe -kun. These are Japanese honorifics, used in the same way one might use “sir” or “ma’am”, but it’s not quite that simple. There’s no way to even give an absolute rule of thumb for using them: it’s a mix of politeness and an indication of the type of relationship people have with one another. In Japan, politeness is quite important, even in daily life, so it’s very useful to know what to make of these honorifics. The most common Japanese honorifics are probably -san, -kun, -chan, and -sama, and they all have a different role, and are used in different situations. If you’re a little bit familiar with Japanese culture, you already know that people rarely use another person’s first name, and therefore, Japanese honorifics are tied to last names. It’s also very rude to simply call someone by their last name. Sometimes, the honorific will be attached to the person’s first name for other reasons, such as when two people are especially close or if you’re a foreigner: unlike Japanese people, we foreigners usually introduce ourselves with our first name, not our last name, and Japanese people tend to respect that choice. The word “honorific” here is very important: it is the key to understanding this complex communication system. Japan uses an important hierarchy, based on criteria like age or social status. According to your field of work or your job title, you might be in a superior, inferior, or neutral position when compared to another person. All these factors are reflected in the way someone speaks, which creates a more or less formal language. Japanese honorifics not only vary depending on the person, but also on other factors like the level of trust, the person’s background, their education or even gender. Even as a foreigner, it is important to respect those rules in order to feel welcome in this country. Note that you shouldn’t use these honorifics when: talking about yourself; when the person you’re talking to asks you not to use them (呼び捨てyobisute, which literally means “call” and “throw away”); when you are talking with someone from your inner circle (内 uchi), like your parents, grandparents, etc. ; or when you are talking about someone from this inner circle to someone outside that circle (外 soto), for example if you’re talking to your boss about your best friend, you should avoid using honorifics when using your friend’s name. Now that you have a better understanding of the basic elements required to delve into the mystery of Japanese honorifics, we can finally explain what they mean, when to use each of them, how to use them, and, of course, what the exceptions are. This is probably the first honorific you’ll learn how to use. You can use it with anyone you don’t really know, regardless of their gender, age or social status. It’s a neutral term, which most closely resembles “Sir/Madam” and is used the most commonly. This suffix could also be added to company or business names, like a pastry shop (パン屋さん, pan-ya-san), but it is also used when referring to mountains and volcanoes like Fuji-san (富士山). This is the most familiar honorific, and is supposedly derived from children who couldn’t say “San” properly. This small mistake was considered cute and stayed in the language. It is used to refer to young women you’re close with, children, babies, a grandmother or even an animal you’re especially fond of. It can also be used in a couple or when talking about someone you like a lot. You therefore need to be careful who you use it with, and avoid using it for people you’re not so close to. This is a suffix seen as masculine, used for teenagers and young men. Sometimes, it is used to refer to young women, but only in very specific situations. It’s usually used by people seen as superior, since this honorific is mostly used when one person of higher status is talking to a younger person. Its politeness level is low and its kanji is the same as the one used for kimi (君), which is an informal way of saying “you”. It can be used when talking with a classmate, a younger brother or younger man. Men only use it with women they are close to and likewise, women will use it with men. The use of the word -sama is the most formal, and is very special. This higher version of -san is used in very specific situations towards people who have a high status, such as with customers in the customer service industry, but more commonly when talking about Japanese deities 神様 (kami-sama). This Japanese honorific bears a sense of social superiority, as in the case of “the customer is king”, and customers are therefore referred to as お客様 (okyakusama). Its English equivalent would be an extremely polite form of “Mister/Madam Customer.” Sometimes, this honorific will be attached to a word referring to a group of people or an audience, such as is the case with 皆様 (mina-sama; everyone), giving an extra layer of politeness to the group. Finally, you’ll also find this honorific in Japanese expressions, such as the famous お疲れ様です (otsukaresama desu), which is used to thank someone for their hard work. There are many more Japanese honorifics, but some of the most common ones are: Buchou (部長), Kachou (課長), Shachou (社長) or Kaichou (会長), which refer to specifically ranked people in a company; and there are also honorifics used mostly in a school context like Senpai (先輩, older person), Kouhai (後輩, younger person) or Sensei (先生, teacher). And there you have it! The basic rules of using Japanese honorifics. Don’t get me wrong, their usage is much more complex and can be difficult to interpret at times, but as a foreigner, people will cut you some slack if you mess up. That being said, if you work in Japan, you may want to be extra careful when using these honorifics; don’t hesitate to ask the person directly what they want you to call them if you’re not sure. 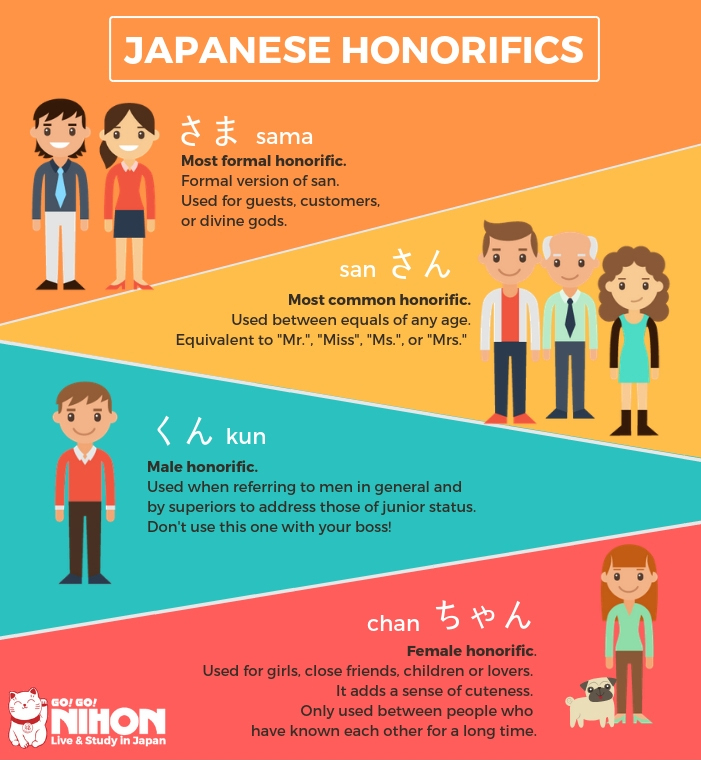 Now that you know more about these well-known honorifics, maybe you will understand better why they are so commonly used in Japanese culture! And if you want to learn more about using Japanese phrases, how about you read our article on how to apologize in Japanese?